Sir Richard Francis Burton was an English explorer, translator, writer, soldier, orientalist, ethnologist, linguist, poet, hypnotist, fencer and diplomat. He was known for his travels and explorations within Asia and Africa as well as his extraordinary knowledge of languages and cultures. According to one count, he spoke 29 European, Asian, and African languages. Burton's best-known achievements include traveling in disguise to Mecca, his seven years in India gave Burton a familiarity with the customs and behavior of Muslims and prepared him to attempt a Hajj (pilgrimage to Mecca and, in this case, Medina). It was this journey, undertaken in 1853, which first made Burton famous. He had planned it whilst traveling disguised among the Muslims of Sindh, and had laboriously prepared for the adventure by study and practice. 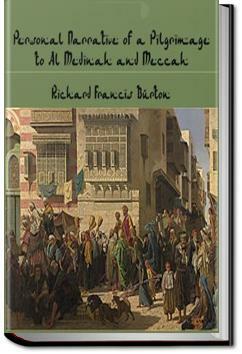 Burton's own account of his journey is given in A Personal Narrative of a Pilgrimage to Al-Medinah and Meccah. . . .d up to the neck, remains in the sun fasting all day; in the evening he is allowed a little food. This rude course of “packing” lasts for about a month. It suits some constitutions; but others, especially Europeans, have tried the sand-bath and died of fever. Mules’ teeth, roasted and imperfectly pounded, remove cataract. Teeth are extracted by the farrier’s pincers, and the worm which throughout the East is supposed to produce toothache, falls by fumigation. And, finally, after great fatigue, or when suffering from cold, the body is copiously greased with clarified butter and exposed to a blazing fire.